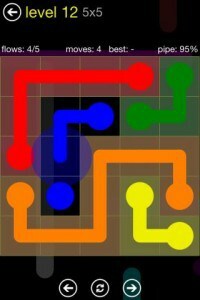 Flow Free is an appealing puzzle game which is likely to get you addicted despite its sometimes obvious simplicity. Graphics is not what Flow Free for Android is all about, obviously. Instead it will get you interested with the different challenges placed before you throughout the different stages of gameplay. But let’s take a closer look at Flow Free and see what it has to offer to the average player. 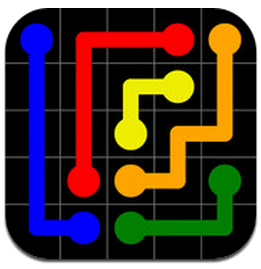 Flow Free for Android is an intuitive game in which you will have to connect dots of the same colors in order to form lines. These lines will have to be placed in such a manner in which they will not cross over each other or intersect one another. There are of course different difficulty levels in Flow Free and depending on these, there are different types of grids with a number of colored dots. As most of the games launched these days, Flow Free is easy to learn. The problem is when you wish to become a true master at this game it gets difficult. The easier levels are accessible but Flow Free gets harder and harder as you move up the ladder. There are actually more than 1000 puzzles through which you can play freely. Thus you can take your time and practice different styles of play through these levels since they are all unlocked. There are two different game types in Flow Free. You can either choose Free Play and take your time as we mentioned earlier or choose the Time Trial mode. In Time Trial you have to act very fast and it is advisable that at the end you take a couple of seconds and quickly devise a plan. In this way you will be able to picture in your head how your future lines will look and move faster. If you think Flow Free is worth your time than download the game from the Play Store and leave us a comment with your opinion.